'MLM' The American Dream Made Nightmare: Reza Aslan - Is the Trump presidency a religious cult? Reza Aslan - Is the Trump presidency a religious cult? The Iranian-American 'religious studies scholar,' Reza Aslan (b. 1972), has had a lot to say about Donald J. Trump. Recently, I was sent a link to the above video and asked whether I agree with what Reza Aslan says in it? At times of mass-alienation (following: wars, natural disasters, economic crises, etc. ), history proves that would-be demagogues steadfastly pretending absolute moral and intellectual authority, whilst pursuing hidden criminal objectives, who (at other times) would have been universally-recognised as narcissistic charlatans, have found it much easier to become widely-accepted as authentic Messiahs. If you Google search 'Trump Cult,' Blog readers will discover that many well-informed commentators have already decided that the answer to the above question is a resounding 'yes.' 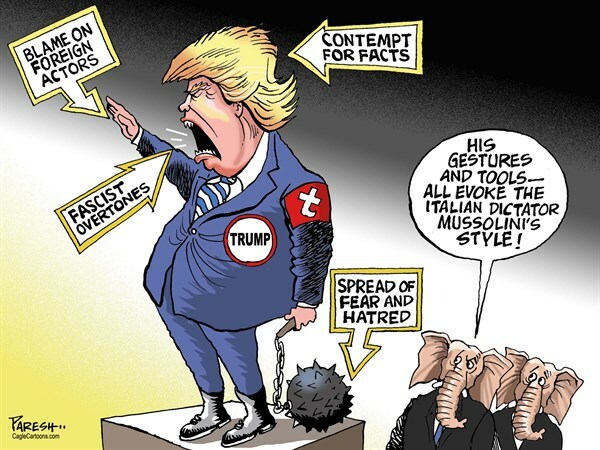 For a long time, Trump has been widely-compared to an assortment of strutting totalitarian dictators and cult instigators (particularly, Benito Mussolini). That said, I would agree that the evolving situation (i.e. Donald Trump's increasingly-paranoid us vs them model of reality and his core-followers' continued unquestioning acceptance of it) is not unique and consequently, it cannot be fully-understood in isolation. Cult gurus treat people around them like dogs. Trump has been doing this for years! Correct Anonymous - It is frightening to consider that Dogs are trained with a system of reward for obedience and punishment for disobedience. Donald Trump is a classic severe and inflexible Narcissistic manipulator. He only allows people around him who accept, and reflect, his own two-dimensional model of reality. There is no way that Trump (who evidently sees himself as a superior, noble and truthful hero battling against inferior, evil liars) would ever willingly-accept to be interviewed by well-informed investigative journalists or prosecutors/investigators. I fear that Donald Trump will go to almost any lengths to prevent himself from being held to account. All persons with fully-functioning critical and evaluative faculties, dissenting from Trump's controlling-scenario are already systematically excluded, and condemned, by it, as the representatives of 'Fake News' or part of a politically-motivated conspiracy to destroy his noble attempt to 'Make America Great Again'.